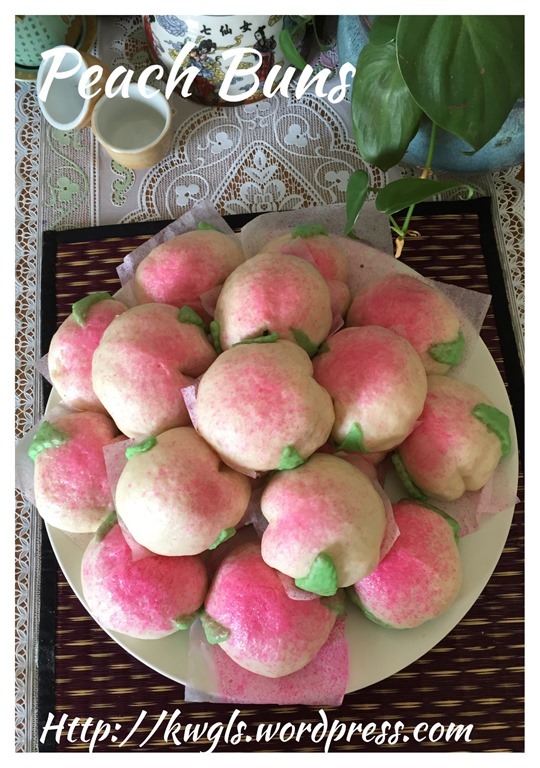 Prior to this, I have prepared another batch of peach buns which is perfectly okay but I did not took the picture of illustration and therefore unable to share with readers. Therefore, the pictures here comprise of two batches and the earlier batch do not have the green leaves. 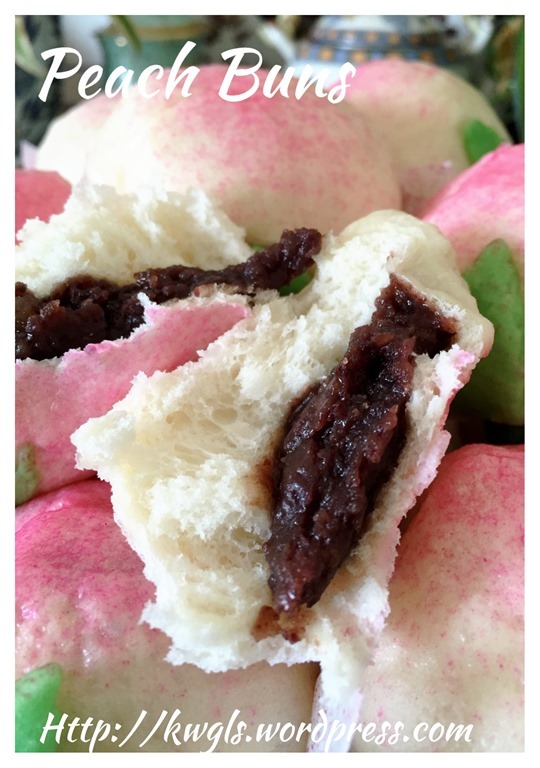 450 grams of red bean paste (please refer here for red bean paste recipes: Homemade Red Bean Paste (家居自制红豆沙馅）or lotus seed paste. Divide the fillings into 30 equal portion of about 15 grams each. Shape round and set aside. 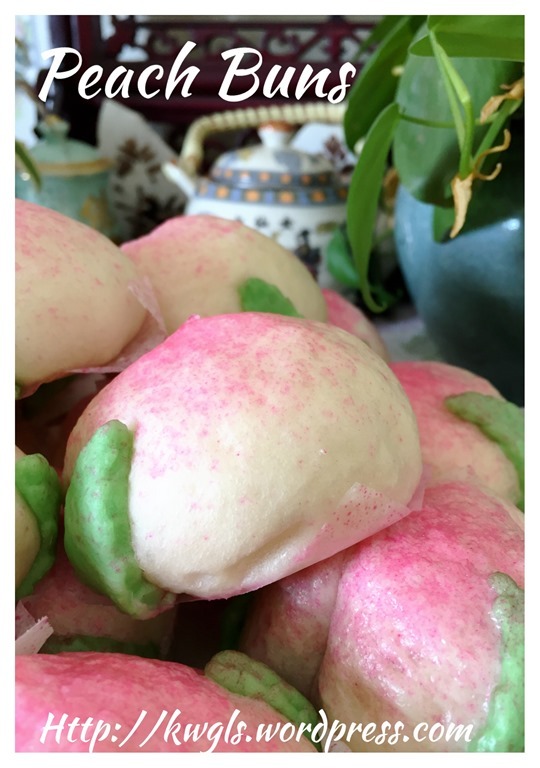 After first proofing, take about 10% of the dough and add a few drops of pandan flavouring or green colouring. knead until the colour are even. Use a rolling pin to roll the dough flat with about 1 mm thickness. 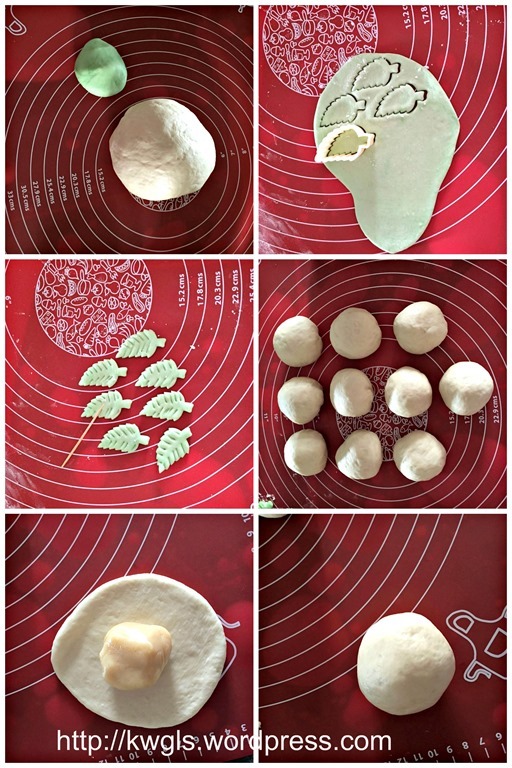 Use a leaf cutter to cut the dough into leave shape and set aside. Divide the proof dough into 30 equal balls, shape round and set aside. 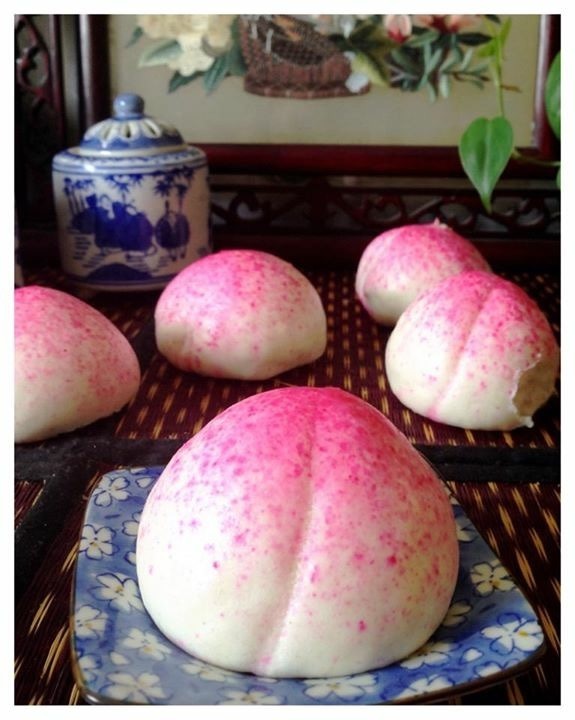 Take one dough, roll it flat and put a ball of filling (either lotus seed paste or red bean paste) on the centre of the dough, Seal the edges follow the shape of filling balls. Shape round. Lightly moisten two green leaves with water and attached to the bottom of the dough ball. 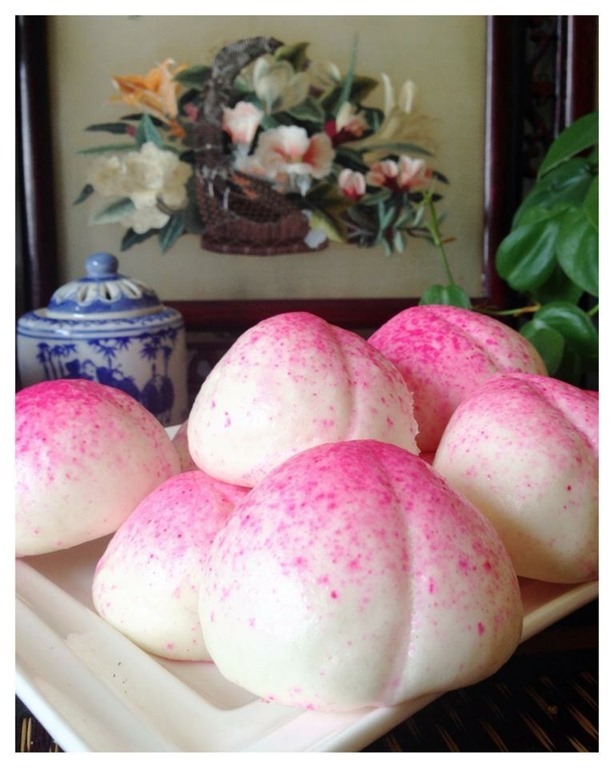 Lightly pull the top of the buns such that it become an oval shape with a point on top. 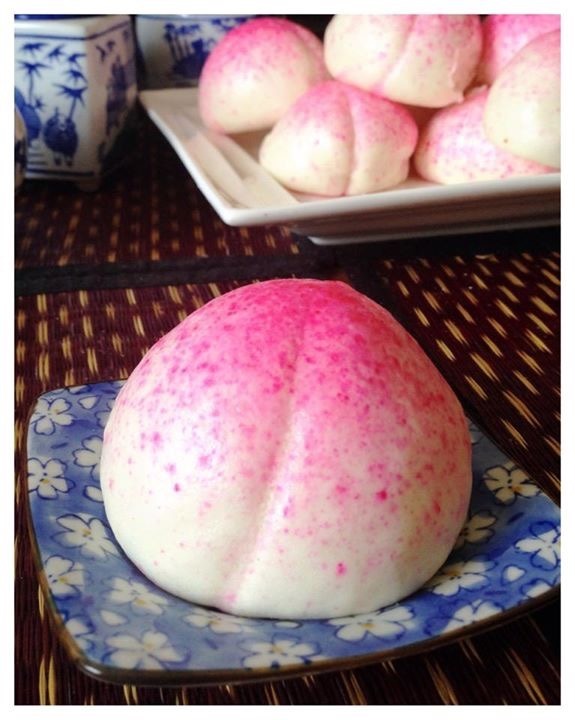 Use a chopstick or spoon to make a dent that look like a peach. 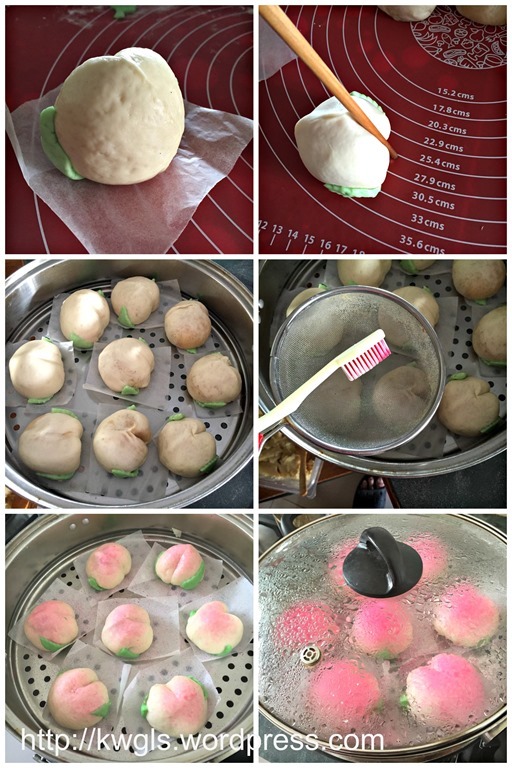 Put the peach buns on the steamer tray. Get ready some red colouring and wet the tooth brush with the red colouring. Place the sieve on top of the buns and brush the wet tooth brush against the sieve. 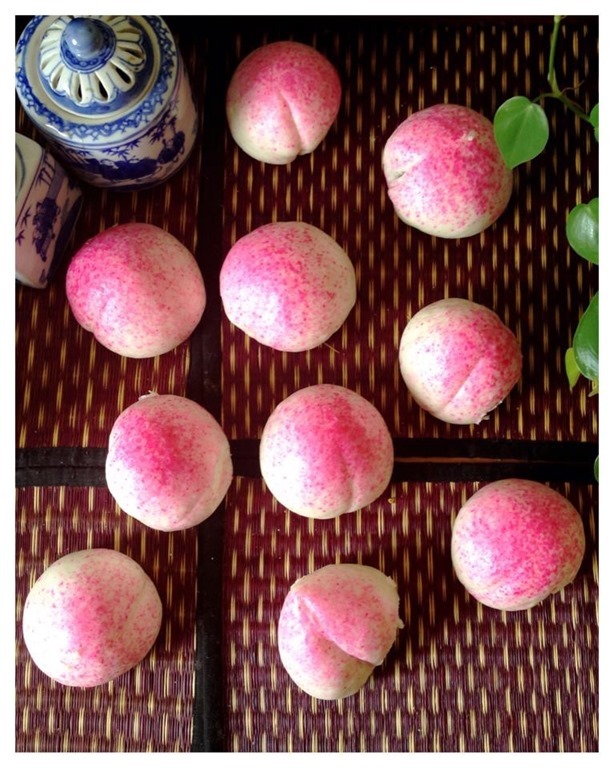 Ensure that every buns have a faint pinkish colour. Let it proof for another 15 minutes. Steam the buns over medium heat for about 10 minutes. Slightly open the steamer lid and let the hot air gradually escape. Sit in the steamer for another 2-3 minutes before fully open the lid. Though it look difficult, it is not actually. Do not be overly greedy with the filling as it will become difficult to shape. 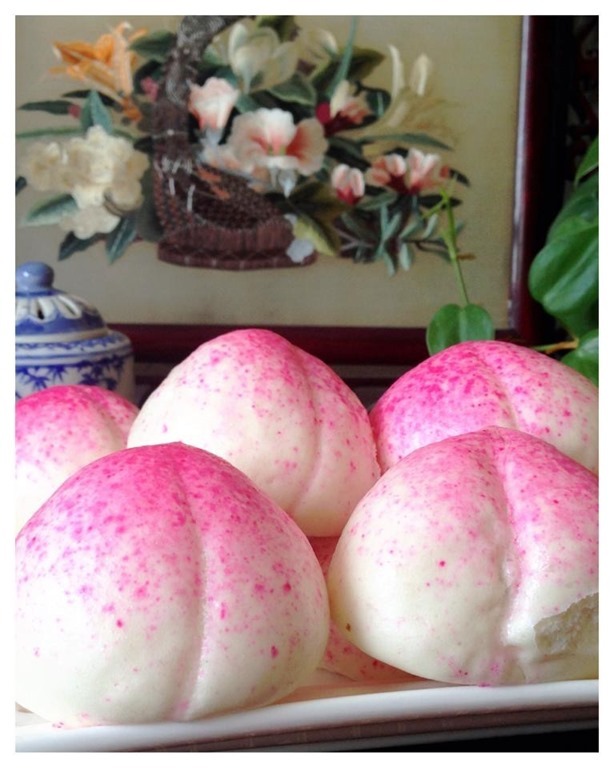 Since it is a 30 buns recipe, you may need to steam in batches. Therefore, timing is very critical in this exercise. If possible, ask someone to help such that the assignment can be completed as soon as possible. As a general rule of thumb, for this bun, it is better to slightly under proof than over proof the buns as over proofed buns will have wrinkle bun surface that is not appealing. 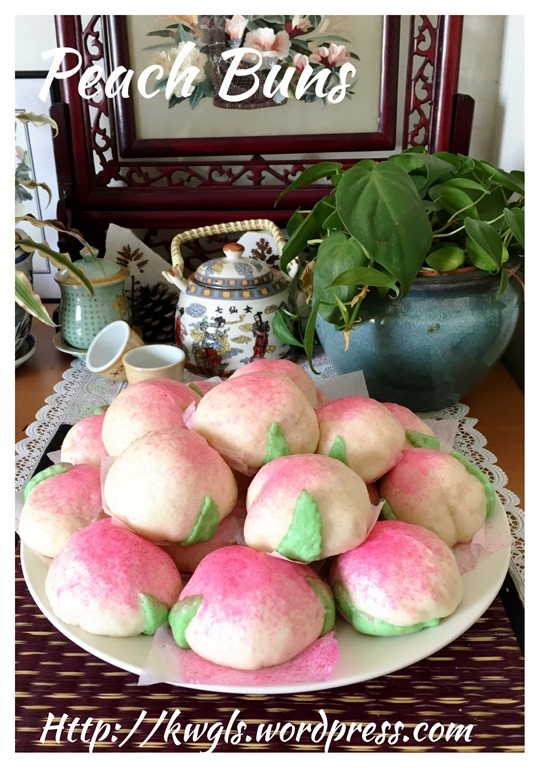 This entry was posted in Chinese and Asian Cakes and Snacks, Food Preparation Series and tagged 8, GUAI SHU SHU, Guaishushu, kenneth goh, longevity peach buns, postaday, 寿桃. Bookmark the permalink. Hi Kenneth, can we use cake flour or plain flour with this, if so, do we still add some cornstarch or potato starch? Thanks.